For our latest 'Exit Interview,' HR Dive visited U.S. Equal Employment Opportunity Commission commissioner Jenny Yang at her office during what will likely be the final days of her tenure. Commissioner Jenny Yang, a Democrat, didn’t leave the EEOC when President Trump removed her as chair and dubbed a republican commissioner acting chair instead. And she didn’t leave when her term ended in July, either. Instead, Yang exercised a not-entirely-unprecedented legal option to stay on until she is replaced or until the Senate recesses. She wasn’t the only commissioner keeping the EEOC tipped to the left (although that certainly could have been the case if Trump had managed to add a republican commissioner earlier), and she said that for her, the decision was more about the things she could accomplish with a few extra months. As for what’s next for Yang, the EEOC’s ethics office has advised her to keep mum on that for now. The following questions and answers have been edited for length and clarity. HR Dive: When there's an administration change and a new EEOC chair is chosen, the outgoing chair sometimes leaves the commission, instead of stepping back down to commissioner. You not only stayed on through that but are now well past the end of your term. How does that work, and why did you choose to do so? 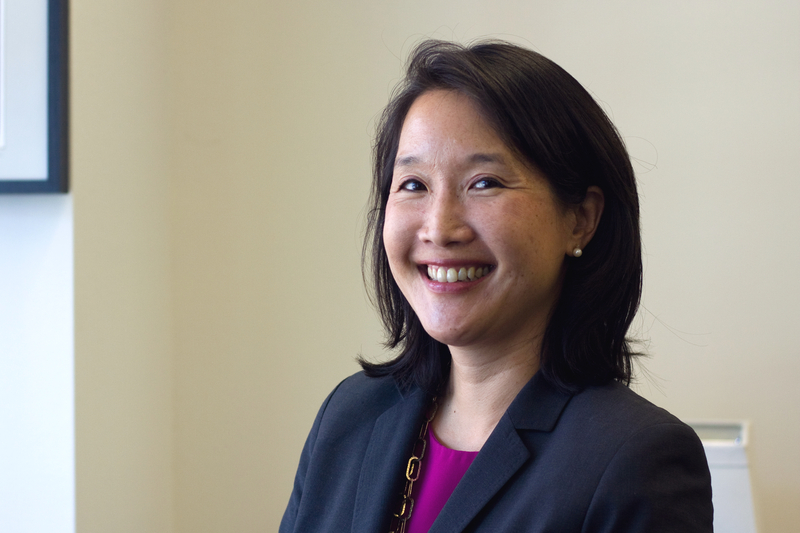 Jenny Yang: Our statute actually provides that the commissioner shall continue to serve until a successor is "appointed and qualified," as long as someone is nominated by the Senate’s August recess. I thought it was important to continue to serve because we have so many important issues that we've been working on. I wanted to do my part to help continue that until we had our successors on board, and I'm glad that I have. We've been able to continue to support good cases moving forward; I've continued to be able to do outreach on important issues. HR Dive: Would you have stayed on if the election turned out differently? Yang: I think I would've been here regardless. I would've wanted to continue to stay because there's good work to do. HR Dive: The commission has done quite a bit since your term began in 2013. Is there anything you're particularly proud of? Yang: One of the things that I'm really glad we did was start a new public input process for our guidance. Previously, we had a commission meeting before we updated a guidance that allowed us to hear from witnesses and people could submit comments. We decided to create an even more transparent process where we would put out our proposed guidance document, so that stakeholders could review the language and provide input. We take the input very seriously, and it has allowed us to make our guidance documents even more valuable. HR Dive: Is there anything else that stands out when you look back at the last few years? Yang: Our pay data effort, which now is getting a second look. We thought it was really important to get better data to help us better address pay discrimination. It was one of the hardest areas for us to make progress in because we didn't have that data. In contrast, hiring and recruiting discrimination was another longstanding priority of ours, but we’ve had a lot more success with that, in part because we have had EEO-1 data on that for over 50 years. We thought it was important to have similar data on pay. There's that, and I think the other significant development has been around LGBT protections in the workplace through our work in the federal sector and also through litigation on the private side. From my perspective, we can't turn back the clock on people's rights and on progress for equality. HR Dive: During their confirmation hearing, Trump’s EEOC nominees didn’t seem particularly enthusiastic about the commission’s stance on that issue — that federal law prohibits discrimination based on sexual orientation. What does that mean for the issue going forward? Yang: Well, I hope that they consult with our career staff. There has been extensive study of these issues and I think that they will learn a lot from folks here at the agency. From my perspective, we can't turn back the clock on people's rights and on progress for equality. I think that it is important that employers continue to have inclusive policies. HR Dive: Returning to your mention of the EEO-1 pay reporting requirements, do you see the future EEOC moving forward with replacement requirements now that the White House’s Office of Management and Budget (OMB) has stayed the commission's first attempt? Yang: Our nominees have clearly said that they would make it a priority to finalize a pay data collection in a timely fashion, so I think it's incumbent on them to adhere to that because this is an urgent problem. We have had significant pay gaps, and they aren't getting better. I think what concerns me about OMB's process is that it was not transparent. The process that they used, I think, stands in stark contrast to the process that we undertook. We had a public hearing, two rounds of comments and meetings with experts and individuals from all sides. We studied this issue exhaustively to ensure that the proposal would provide useful data for our enforcement purposes while at the same time minimizing the burden on employers. OMB, in its memorandum, provided very little explanation for why it was taking this action. HR Dive: Is there anything that you didn't get to that you would like to see EEOC address in the future? Yang: One of the persistent problems on which we have made progress — but that I'd like to see us make more — is occupational segregation. When we look at our EEO-1 data throughout the years, we still see persistent occupational segregation by race, ethnicity and gender, widespread across industries. Progress has really stalled quite a bit since the 70s so I think that is an area that we need to continue to look at — both as the EEOC and as a country — because it is contributing to an increasing wealth gap and broader social inequality. HR Dive: Do you have an idea of what EEOC action on that issue might look like? Yang: I think there could be both an education strategy where you're looking at patterns across industries and also an enforcement strategy. We’ve looked at particular industries, like the tech industry. Those jobs are vital to our economy going forward and they're increasing at higher rates than other sectors, so I think it's really important that people from all backgrounds are having those opportunities. HR Dive: Anything else we can expect to see from the commission anytime soon? Yang: We had a meeting on the use of big data in hiring and selection and that's something that we're continuing to look at. Big data is already changing how people are hired and it's important that companies really understand what they're selecting for, who they're including, who they're cutting out, and to ask questions about what the algorithms are really doing. Big data has the potential to reduce subjectivity and help employers make job-related decisions. At the same time, it can also institutionalize discrimination into a process, particularly where people aren't asking questions about certain correlations and some of the unintended results from those screens. Often some of the folks marketing these will just say, "Oh, it's been validated in all situations." You have to go beyond that and look at what the selection device is doing. I've talked to defense lawyers who are working with these data scientists who have no idea often about EEO requirements, so they're not necessarily thinking about that as they build these algorithms. I think training front-line managers is a really smart investment. That's the real interaction that you're having with your employees. HR Dive: Do you have any recommendations for HR professionals responsible for compliance with EEO laws? We hear over and over that untrained front-line managers often cause violations; in your view, is training in that area a good use of time and resources? Yang: I think training front-line managers is a really smart investment. That's the real interaction that you're having with your employees. I think it has an incredible role in whether people feel that they're being treated fairly, and whether they have an opportunity to succeed within an organization. One of the things that our managers really appreciate is practice and concrete strategies on how to deal with difficult workplace situations, because everyone faces them. The more managers feel they’ve been given the support they need to handle them well, the more they'll be willing to address them, versus letting some problems fester. Where organizations make that commitment to their front-line managers, it can make a real difference in workplace climate. HR Dive: Any final thoughts as you wind down your time with the commission? Yang: Justice Kennedy wrote in his marriage equality decision that “the nature of injustice is that we may not always see it in our own times.” I think that has always been true throughout our time as an agency. Our first commissioner charge when the EEOC opened its doors involved an airline policy that required women to resign as soon as they married. Many people at the time thought these policies were completely justified for business reasons. We just filed a case against Whataburger where we alleged that a manager was instructed not to hire anyone whose name didn't sound white, because they thought that was what their customer base preferred. The HR community now has an especially important role to play in advancing equality. So we continue to see those systematic barriers in many different industries. Often, people don't even see it; they're not even challenging the assumptions that they're making. I think that is something that we all need to challenge ourselves to see: what are some common practices that, in fact, are serving as barriers to opportunity? The HR community now has an especially important role to play in advancing equality. The workplace is really one of the only places where people from a wide variety of backgrounds get to know each other. I think employers and the HR community can play a role in helping to bridge the divide. I think it's an important time to be doing that.